If you’re considering buying a ukulele for the first time then the ukulele buying guide is the page for you. From sizes and strings to budgets, brands and buying tips. Hopefully I can help you to avoid the mistakes that I made when I bought my first ukulele. There are 4 main sizes of ukulele and each has its own characteristics. Smallest to largest we have soprano, concert, tenor and baritone. When it comes to buying a ukulele, it’s good to get a bit of knowledge about each one. I personally had no idea that ukuleles came in different sizes when I bought my first ukulele. I ended up buying a concert scale ukulele as it was pretty much the first one I picked up. The soprano ukulele is the one most people picture when the word ukulele is mentioned. Typically it has the smallest body and the shortest fretboard. Due to it’s size it’s very portable. There’s a fairly common misconception that the smaller the ukulele the more difficult it is to play and this is often levelled wrongly at the soprano. Sopranos usually have between 12 and 15 frets (I’m a fan of 15 fret sopranos personally). Concert size ukuleles are a little bigger than sopranos. Typically they have between 15 and 20 frets and as a result of the longer scale length the tension on the strings is more than the soprano (meaning they require a little bit more pressure on the strings). The larger body gives a fuller sound than the soprano, although the strings are tuned the same. The tenor ukulele is larger in both scale length and body size than the concert. Typically it has 15+ frets and is tuned to gCEA just like the soprano and the concert. Due to it’s larger body size you will typically get a fuller sound from a Tenor. The baritone ukulele isn’t tuned to gCEA like the other sizes/scales. Instead it is tuned to DGBE which is the same as the top 4 strings on a guitar. Due to it’s larger body, size and tuning it has a very different sound to sopranos, concerts and tenors. If you’re a guitar player it would be a very smooth transition to a baritone. If you don’t have a specific reason for picking a baritone ukulele then I would probably recommend against it for newcomers. Due to it’s variation in tuning you’d have to learn different chord shapes and there isn’t anywhere near the volume of learning material out there for baritone that there is for the other sizes. Humble Baritonics is a great site if you are interested in the baritone though. It’s definitely worth trying out a few different sizes before you make your purchase. Most players find a size that they really like and feel much more comfortable holding and playing (personally I’m a soprano man). Ukuleles bodies tend to be either solid wood, laminate or plastic. Typically a solid wood ukulele is more expensive than a laminate or plastic ukulele but that doesn’t necessarily mean it’s a better choice. Laminate and plastic ukuleles start at around £20 ($30) and can rise into the hundreds. Solid ukuleles start at around £90 ($135) and can rise into the thousands. When it comes to solid wood ukuleles, the choice of wood has a big impact on the sound (and price). Here’s a great guide to the choices and types of wood and their impact on the ukulele sound. Although laminate and plastic ukuleles are typically cheaper than solid wood ukuleles there are some great examples of both and you shouldn’t write them off on construction material alone. There are more and more plastic ukuleles appearing now. Plastic ukuleles tend to trade on the fact that you can take them camping, to the beach or anywhere else you might feel. They offer a different sound – the plastic ukuleles I’ve played tend to boom a little bit while at same time sounding a little plasticky (if that makes sense). You’re making a certain compromise on the sound for durability here. There are hundreds of ukulele brands and it can be confusing to know where to begin. Ultimately you should always aim to play any ukulele before you buy it but that isn’t always realistic (shops with a good selection of ukuleles are few and far between). If you can’t try before you buy then look for recommendations from someone you trust. I have in the past or currently own ukes by Kala, Lanikai and Ohana. All make fairly decent starter ukuleles and have established good reputations in the market. How could I get this far without talking about budget? It’s probably the most important factor when it comes to buying a new ukulele. Don’t buy the cheapest ukulele that you find. You’ll end up buying twice (or just quitting playing). The absolute worst thing you can do is buy the cheapest ukulele that you can find, you’ll end up finding it difficult to play and ultimately not enjoying playing it. Get a budget in mind, whatever you’re comfortable spending and find the best ukulele available within that budget. To give you an idea of cost, ukuleles typically start at around $20 and rise well into the thousands. There are playable ukuleles from around $30 if you do your homework, just be warned that there are quite a lot of bad ukuleles out there too. If you can get to around the $50 – $70 bracket that’s an ideal scenario. Strings have a huge impact on the sound of a ukulele and this is never more noticeable than at the cheaper end of the market. Typically cheap ukuleles come with cheap strings and they can sound very bad. There are loads of options when it comes to strings and really the only thing to do is try some. If you Google around you’ll find all manner of players with different opinions on string brands – some people even using fishing wire. Personally I like Aquila, but there are plenty of other options too. Make sure you buy the right strings for the size/scale of ukulele that you own! Now you’ve read my guide, here are some tips for when it comes to actually making your purchase. Do your homework before you buy. Try a friend’s ukulele, read reviews and go in with a little knowledge. Spend as much time as you can going through this guide. If you need some help, drop me an email – I’ll do my best to get back to you with my honest opinion. Spend as much as you can afford to. Don’t just buy the cheapest ukulele you can find, you’ll end up frustrated or just giving up. As mentioned above if you can get somewhere around the $50 – $70 bracket that’s great, if not you’ll just need to do a little more research. 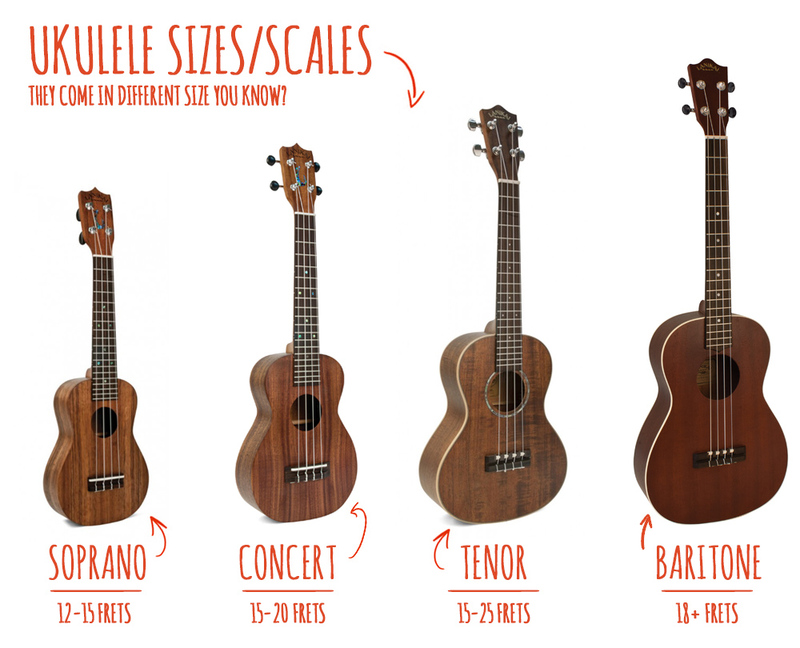 Try each different size/scale of ukulele to see which works best for you. Even if you can’t play a single note, pick it up and get a feel for it. Is it comfortable for you to hold, can you get your fingers on to the frets without too much hassle? If you’re going to a shop, take someone with you who has played ukulele before. I cannot recommend this tip enough. If you don’t yet know how to play then it makes a whole lot of sense to take someone with you who does. Buy a clip-on tuner (and potentially some good strings). You don’t need to buy much in the way of extras when it comes to ukuleles but you should grab a clip-on tuner if you’re a newcomer. They’re cheap and will stop you getting frustrated. Here are some of the best ukulele tuners (all quite cheap). Hopefully this guide will give you a little bit more knowledge so you feel more comfortable buying your first ukulele. Take a look at my ukulele reviews too and my best ukuleles for beginners to help make your decision!